Starting your own clothing line is exciting but before you begin here are a few important tips for beginners about to embark on the ride of their life. 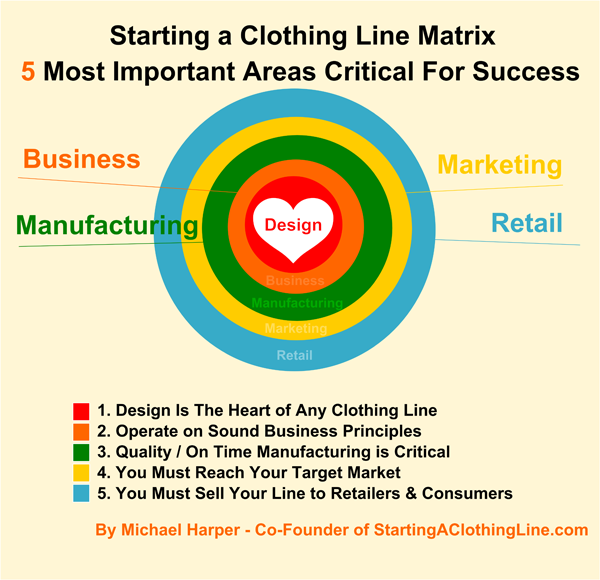 There are 5 important steps and areas that are critical to your success as you start your own clothing line. You must do well in all 5 to be successful. In reality, all of these steps are done at the same time. The 5 areas are Design, Business, Manufacturing, Marketing and Retail. So let’s begin with Design. Design is the heart of any clothing line or fashion brand. Without sellable designs, you do not have a clothing line. Create designs that people want. Whether you are following trends or going on your own path, you still want to make sure there is a market for what you are creating. Before getting limited or mass production made – show off your design sketches and samples to see how much interest there is in them. Even see if you can get pre-orders. This will tell you if the design you are thinking of producing is viable. Remember, it is not just about your taste and artistic express – it is also about will it sell! 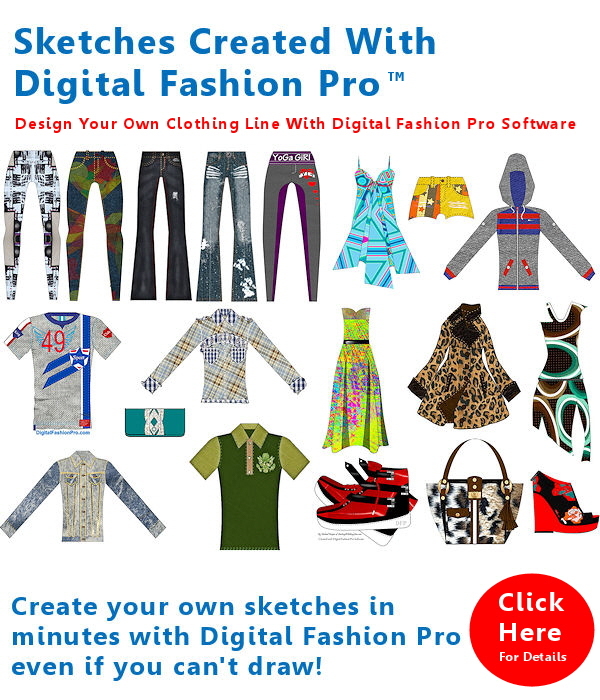 A good way to create your fashion designs is using fashion design software like Digital Fashion Pro. You can create the sketches that you will show to potential buyers and to manufacturers with it. If you haven't started using a computer assisted design program to design your clothing, it is time you truly consider it. The US Department of Labor - Bureau of Labor Statistics States: "Fashion designers use technology to design. They must be able to use computer-aided design (CAD) programs and be familiar with graphics editing software," as one of the things necessary to be a fashion designer today. Something else you want to consider as you design your collection is to keep it simple. Don’t try to do a large collection just starting out. Pick an item and specialize in it before moving on or adding to your product line. For example say you pick one popular dress style. Focus on that dress style but offer it in different colors and prints. This will help you cut down on manufacturing expenses but also allow you to gain expertise with that style and business experience. The next important step in starting a clothing line is operating your clothing line on sound business principles. While there is much to read on starting a clothing line on the internet, there is still is an enormous amount of untold / critical information that a designer will want to have. Many articles may rank well but many are posted by people that lack direct experience with starting a clothing line from scratch, or have worked with manufacturers from all over the world and retailers. Such general information while helpful is only half of the things a new designer needs to know. The business end of your clothing is more important than design. You can have the best designs but if you make too many mistakes it could jeopardize your business. Do the research, get a industry mentor and check out products like The Official Step by Step Guide to Starting a Clothing Line. Quickly before I move on, We were asked by a client – why should he set up his line and register as an LLC before getting his T-shirts made. We advised him that it is important to legally set up his business first. One reason for this is for tax advantages. If you set your business up properly in the beginning, you won’t have to double back when things get busy. Also as you begin to get interest in your line from retailers or investors - you do not want to look unprofessional because you haven’t even formally set your line up. It is just not a good look. Handle your business first if you are serious about getting in the fashion industry! Manufacturing is a key aspect of launching a clothing line. You want to make sure your manufacturer is giving you a great (competitive) price. Make sure they can deliver on time. The most important thing is to make sure they will delivery quality merchandise to you. You want to make sure you understand what all can go wrong so that you can plan ahead and address it before it even happens. You want to make sure your production samples are exactly the way you want them. You want to make sure you have mapped out how the goods will be shipped to you and where you will store the merchandise. The Official Guide I mentioned in Step 3 can definitely help you learn more about manufacturing and give you some detailed insight and experiences. Marketing is an important factor of launching your clothing line. You want to not only define your target market of end-consumers but you need to target retailers that sell similar items and price points as to which you do. Once you have identified your market, you must devise a plan to reach each segment. Will your marketing plan include advertising, social media, word of mouth, fashion bloggers and influencers or public relations? Maybe it will include each of these methods. However you choose to market your clothing line, be sure you brand message is the same across the board. Become known for specializing in a certain area or style. Make sure your price points are in line with the market and your product quality. Don’t just slap a high price on something just because you think you can. At the same time, don’t just put a low price on something if it doesn’t allow you to make a profit that will sustain your business. Make sure you are promoting your clothing line every chance you get. You should be a walking billboard. Make sure all of your product photos and marketing materials are high quality. Engaging in each of these principles will make your job of marketing your fashion label easier and more efficient. Retail is one of the most important aspects of starting up a clothing line business. Without retail – you do not have a business. You should have a clear and concise plan as to how you will retail your product. Who do you want to sell it? Will you sell it directly from your website too? (Recommend that you do!) You want to make sure that you know how to approach retailers and know the questions they will ask before they are even asked. You want to give them the confidence that shows you know what you are doing. You want to excite them about your product but you also want to excite them with your direct plan of how you are going to help them sell your product. You want to impress them with your overall marketing strategy. If you accomplish that, have awesome designs, superior quality merchandise and you can deliver on time – then your chances of getting in their store are increased. You want to make sure you have the competitive advantage over the next guy trying to get his or her line in their store. This is why investing in products like the Official Guide or Fashion Mogul Package from StartingAClothingLine.com can really help you become really knowledgeable about the fashion industry. Investing in items that can help give you an advantage and working with mentors can only strengthen your clothing line and you as a business owner.